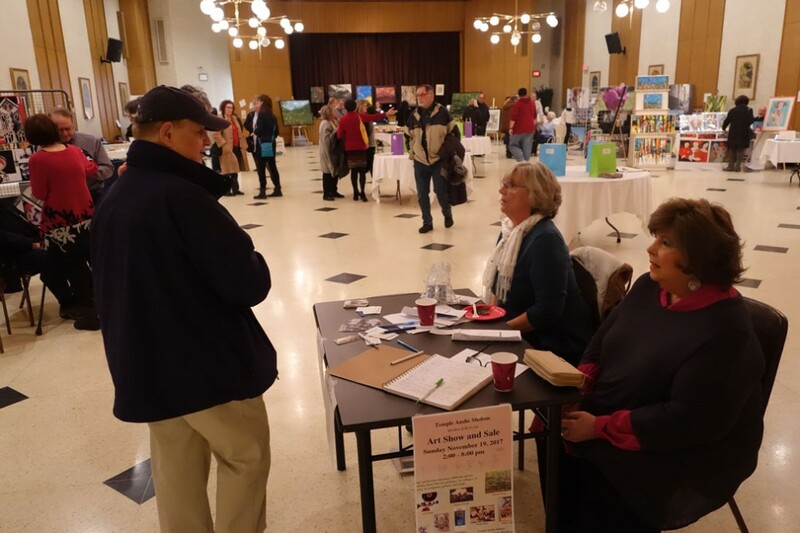 November 19, 2017 was the day that Temple Anshe Sholom hosted its first annual art show. This was a project of the synagogue's social action committee as an opportunity to help raise awareness about local Jewish artists and to help them engage with the community in a meaningful way. Fifteen artists displayed their fine art included paintings, jewelry, photography, collages, Chinese brush painting, Judaic textiles, etched glassware, and more. A “by invitation” only show, the committee made the decision to choose artists who produce fine art as opposed to crafts. One visitor said that the high level of the artwork inspired her to go back to making art herself. There was a constant flow of people who came to browse and shop. Each artist donated a piece from their collection to a raffle that allowed ticket purchasers to choose which work of art that they wanted to win. Live music was provided by Doug Collins on his harp throughout the event. Refreshments were donated by Cake and Loaf, the Dundurn Market, Fortino’s on Main Street and from the artists themselves. Significant funds were generated from the event (it should be noted that artists were able to keep 100 per cent of their sales). They are going to the Temple for consideration towards a number of causes, with restoration of some of the artwork in Temple’s permanent collection being but one of them. The overwhelming success of the show has encouraged the social action committee to set the date for the next show, scheduled for November 4, 2018.